Well, I know three minutes is not a lot and seems to be a waste in a way, why even follow a show that you wait more than 100 times longer waiting for it than you do actually watching the show? Well because, honestly, its AWESOME! I love the characters and who could not fall in love with such a kind sister like this. Personally I wait all week just to see this cute 3 minute clip of an anime and every time I walk away feeling a little more happy. I truly suggest you give it a watch and let the older sister fun begin. 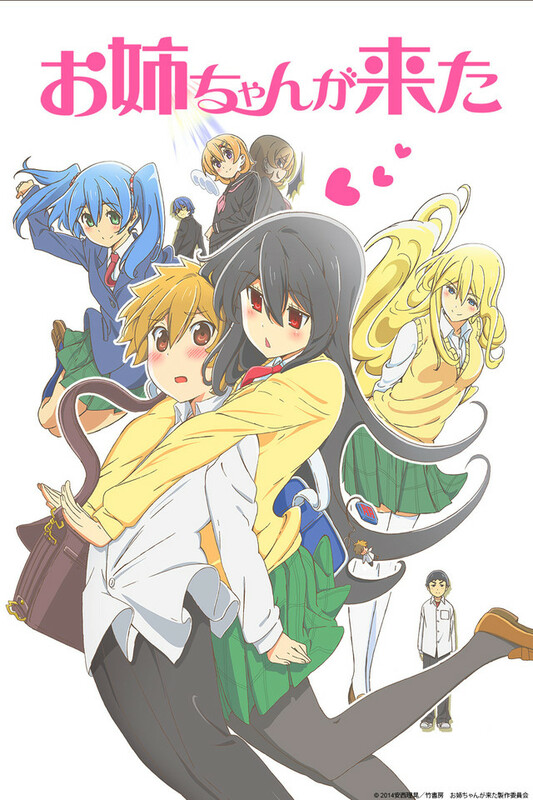 Opinion on "Onee-chan ga Kita"
It is difficult to review a show that is roughly 5 minutes each episode and it is more difficult when the adaptation of it is from a 4-panel series. What to keep in mind here is that any anime is subjected to disapproval from anyone, so it would give the anime no justice to say that the anime was a piece of trash without considering the intended audience and purposes of the anime itself. Since this anime is a short one of short time-frame for each episodes, it would be difficult to comment on things like the plot or character development. What need to be understood is that watching this anime doesn't require extensive emotional investment because there is no time for such luxury, so the show will most likely appeal to other aspect of entertainment such as art style and quick character interactions. To sum it all up, any viewer that is expecting great plot development or emotional scene that bring anyone to tears, they are going to be going home empty handed. However if you want a quick five minutes of cuteness and or slight forbidden interaction between sibling, adding on a few humorous comments, then you might get yourself something to laugh at for 5 minutes. In the end, I recommend anyone who like to squeeze a bit of anime fun between their busy schedule this anime to watch while their boss is not watching and to those who have plenty of time in their hand to understand that this anime will not offer them anything too substantial. As everyone else notes, it is only 3 minutes a week. It is well worth three minutes of your time as it is a cute story and a good comedy. Not sure where the story is going but no doubt its going to get even weirder than it already is. As far as the art style goes all of the characters are attractive and well drawn but his older sister is drawn differently than the rest of the cast. Her eyes and mouth are done in a different style and it bugs me a bit as I want to like her but her triangle mouth is making that hard. Either way, the show is high quality animation so you should be able to get past the slight oddness of one character. I was really interested when I heard of this anime, as it wasn't the typical younger sister routine, but instead a younger brother. So far (2 epidsodes right now) it is really entertaining. The older sister is very stalkerish, but in a cute way. The younger brother is very vocally annoyed, but he isn't a complete jerk, and even apologizes when going to far. The biggest strike against this show is the fact that the episodes are only 3 minutes long. For some shows, that's fine. But this really has the potential to be a full "20 minute episodes" show. Despite that, the pacing is surprisingly great. It manages to get a lot of things done without rushing (like Teekyu). So, despite the short length of the episodes, the quality is good enough to deserve 5 stars. When I finished the first episode I had to go to the episode list page to make sure I hadn't just accidentally watched a preview for an episode...Nope that was the whole episode. Why must they do this to me. Unlike some of my other reviewers I enjoyed it! First impressions are astounding, I might actually enjoy this show. The run time seems to only be 3 minutes and that my be all my brain can handle as it has already begun to explode from the randomness and shear brain hurty goodness (that is a technical term) that this show provides in its short run time. It is cute. What else did you want? The point is to be cute and they succeed. This isn't going to be an award winning anime that isn't the point of shorts anyway. They clearly had the objective to be cute and they did just that. If you expected anymore you don't understand how shorts work. You won't lose anything, if you decide not to watch. Maybe you should save this anime for later, when you have a short break, but you have nothing to do. There is no such thing here as story, just the basic setting, that will be the base for all of the 12 episodes, so don't have to watch it all at once. The story is about a high school girl becoming the older sister of a boy (due to family circumstances) and it's like love at first sight (one-sided). Being a siscon myself, I can't deny that I love the plot, this story is very hilarious and for a short time like this, I think it's really well done, no problems about following the pace, for me at least. Too bad we've only 480p here on CR, it quite ruined the design and if I noticed it on a small 768p screen, I think it might look kinda awful on any HD TV. Is it as good as something like Senyu, no. Is it worth three freaking minutes of you time? Yes it is. Very much so. There are a lot of short anime that have come out this season, this one being among them. Some of them are arguably much better. Tonari no Seki-kun for instance, is fantastic, while others like Sugar Soldier are so damn short and fast, I'm not sure if Data jumped the gun and I went to warp factor 2000. So it may not be the best short anime to come out this season. Oh and the voice actress who plays Yukii in Mirai Nikki is here. So go watch this.